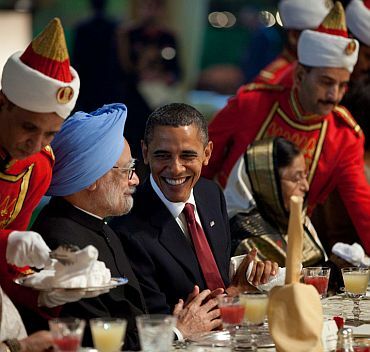 Hard-selling American military technology to India, United States President Barack Obama has assured Prime Minister Dr Manmohan Singh in a top-secret letter signed by him that the 'US is a willing, capable and reliable defence partner to India'. Coming on the heels of a report by the Stockholm International Peace Research Institute terming India as the world's largest arms importer, overtaking China, Obama has offered high technology defence sales. 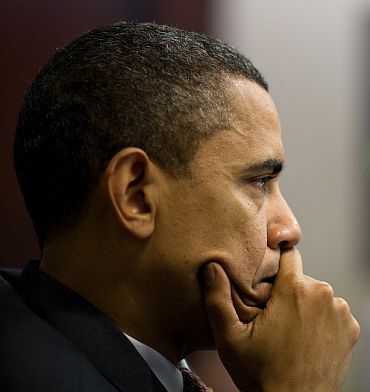 Obama has sought to drive home the point that the American contenders in the Indian Air Force's multi-billion dollar Medium Multi Role Combat Aircraft bid -- the Boeing F/A 18IN and the Lockheed Martin F 16IN -- are far superior than the competition. The IAF is expected to finalise the bid's winner by July. 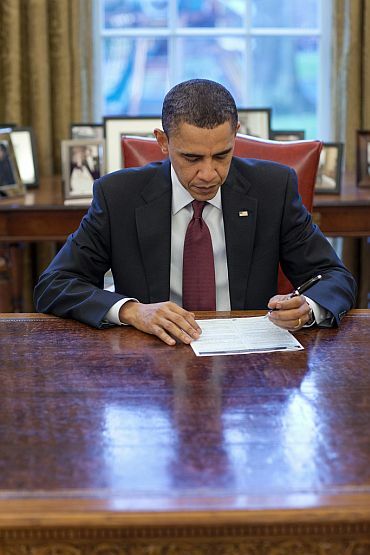 Click on NEXT to read the text of Obama's top-secret letter...! On behalf of the American people, it was my sincere pleasure to experience such a warm welcome from the people of India during my visit last November. Both Michelle and I would like to thank you again for the hospitality shown by you, Gursharan (Dr Manmohan Singh's wife) and the people of India. I viewed the warm public reception as a clear reflection of our nations' strong sense of shared values and democratic beliefs that underpin and drive our strategic partnership. 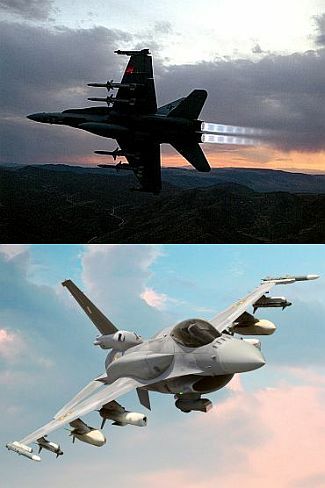 The United States government is offering India two of the most advanced multi mission combat aircraft in the world -- the Boeing F/A18IN and the Lockheed Martin F16IN. These aircraft have a demonstrated qualitative military advantage over any current fourth generation plus aircraft without the associated developmental or technical risks and both aircraft have an unmatched track record for reliability, resulting in lower operating and maintenance costs. The US proposals will dramatically enhance India's own aerospace industrial base and defence capabilities. Additionally, you can be confident in the probity and transparency of doing business with American companies. Let me reassure you that the United States is a willing, capable and reliable defence partner to India. High technology defence sales are increasingly a cornerstone of our strategic partnership. We have broken new ground with the advanced systems we are offering India with these aircraft, including the operationally-proven US Active Electronically Scanned Array (AESA) radar technology. This type of technology is only provided to our closest allies and partners. Equipped with this technology, we are confident both of these aircraft will exceed the expectations of the Indian Air Force. We are committed to continuing to offer India superior technology, including efforts to jointly develop the finest cutting edge technologies. I view the MMRCA acquisition as a key step along this path. During my visit in November 2010, we committed to expand our relationship in new and ambitious areas giving our people a vision of strategic partnership that promises decades of close collaboration in the pursuit of the shared goals of prosperity and security. Through our recent initiatives, the United States has demonstrated its commitment to India's rise and its global leadership role. The selection of a US proposal for the MMRCA tender will strengthen our partnership, launch our defence cooperation on an ambitious and rewarding trajectory, and provide strategic continuity to our growing relationship. I am grateful to our friendship and I respectfully ask that your government give its full consideration to the commercial, technical and strategic merits of the US proposals. US dictating India's big defence deals? Who is mucking up India's defence build-up?